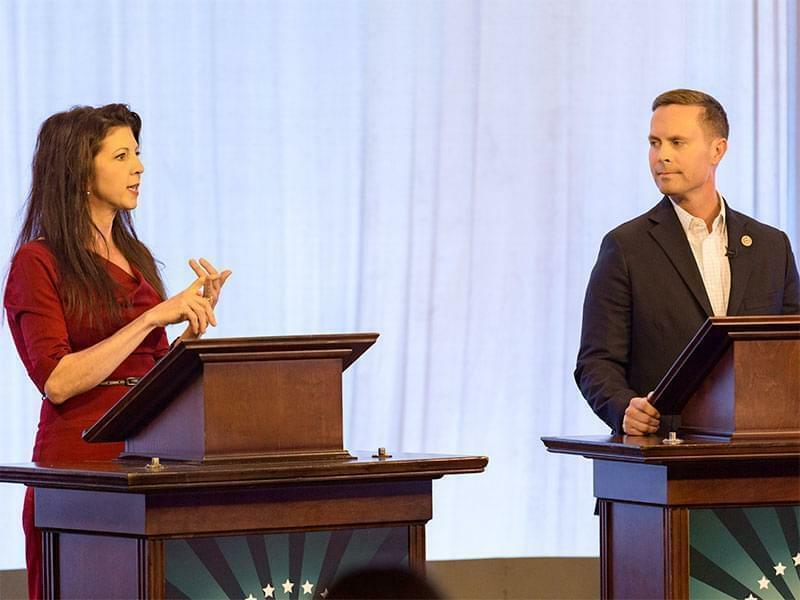 Democrat Betsy Dirksen Londrigan and U.S. Rep. Rodney Davis, a Taylorville Republican, at Thursday's debate in the WILL-TV studios on the University of Illinois campus in Urbana. Health care, trade, and the tax overhaul are three of the biggest issues in the race for the 13th Congressional District between incumbent Rodney Davis and challenger Betsy Dirksen Londrigan. Those issues are also where the candidates are getting sloppy with the facts. Davis and Londrigan met again Thursday for the second of four debates before the Nov. 6 election. The 13th District is one of the most closely watched races in the country, with Davis as a top target for national Democrats looking to win two-dozen seats to retake the House majority. The candidates disagreed about how insurance coverage for people with pre-existing conditions would change if the Affordable Care Act were repealed and replaced with the American Health Care Act. “Don’t believe the lies that I’m trying to take away pre-existing condition coverage, that is not the case,” he said. Londrigan responded to Davis, saying the AHCA would weaken protections for people with pre-existing conditions. It may prevent coverage denials, she said, but it would not prevent insurance companies from discriminating against people with pre-existing conditions by charging them more. Thus, while Davis is technically correct in saying the AHCA would not change the ACA’s guarantee of coverage for people with pre-existing conditions, Londrigan is right in saying protections would be weakened under the AHCA, since the bill could have allowed rate hikes for people with pre-existing conditions that many could not afford. Kaiser Health News / NPR: FACT CHECK: Who's Right About Protections For Pre-Existing Conditions? Washington Post, Fact Checker: Would the House GOP plan have prevented ‘price discrimination’ against people with preexisting conditions? Under the plan, people would have the option to purchase insurance through Medicare, the federal health insurance program that is currently limited to people 65 and older and those with certain disabilities and illnesses. In response, Londrigan said she has never supported the “Medicare for all” plan, but rather supports “Medicare as a public option” in which those who buy into Medicare would have additional costs beyond what current Medicare enrollees pay. “In past interviews with the Herald & Review and in public appearances, Londrigan has said she would instead support a public option, or other fixes to the Affordable Care Act. In a Feb. 25, 2018, candidate questionnaire in the State Journal-Register, Londrigan referred to Medicaid-for-All as a 'good option ... being discussed.'" Whether a public Medicare option would drive down costs, as Londrigan said, remains to be seen and would ultimately depend on which of the many public plan proposals takes effect. UCLA health policy researcher Gerald Kominski tells Kaiser Health News he anticipates public plan buy-in proposals would drive costs down in areas where markets have only one or two health insurance options on the exchange. The most recent data from the Centers for Medicare and Medicaid Services shows about half of all U.S. counties have only one insurance option, and the vast majority of Illinois counties have two options. Kominski predicts a public insurance option “would have little or no effect” in places with more than two options. Politifact Wisconsin: Would Medicare for all really double every American’s tax bill? 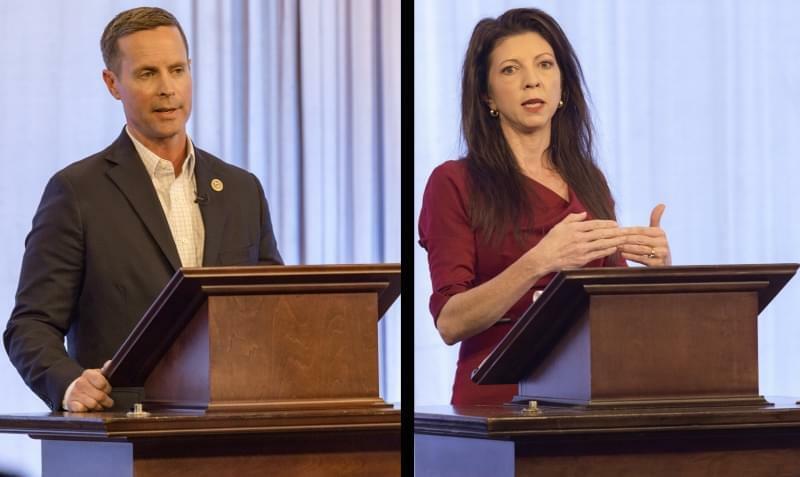 Davis used the same 88 percent figure during Monday’s debate in Springfield. This is misleading and inaccurate. The “88 percent-$1.28 trillion” figure apparently originated in a July 29 op-ed in The Wall Street Journal. It was later shared by the White House to bolster its case that the tax cuts passed at the end of 2017 were key to economic growth. The Congressional Budget Office (CBO) “now projects that additional revenue from this economic surge will offset 88.2 percent of the estimated 10-year cost of the tax cut,” wrote Mike Solon from the U.S. Policy Metrics. That estimate comes dividing rosier revenue estimates (+$1.28 trillion) from the CBO by the initial cost estimate for the tax bill ($1.5 trillion). The bipartisan-led Committee for a Responsible Federal Budget (CRFB) found Solon’s claim (since repeated by Davis) creates a “misleading and inaccurate picture.” For one, the $1.5 trillion price tag is actually low. The CBO says it’s more like $1.89 trillion. “Economic growth since President Trump took office will equal less than 40 percent of the cost of the tax cuts under CBO's estimates, and the tax cuts themselves will only self-finance a projected 17 percent of their costs,” the CRFB wrote. The New York Times reached a similar conclusion just this week, pointing to new Treasury Department data showing the federal deficit widened by 17 percent in the 2018 fiscal year, to $779 billion. That’s unusual for an economy that’s doing well. Committee For A Responsible Federal Budget: Has the Recent Economic Boom Offset 88% of the Cost of the Tax Cut? U.S. Sen. Mark Warner from Virginia is one of many Democrats who've used the 83 percent figure: "The top one percent of taxpayers are expected to receive 83 percent of tax benefits," he said in a 2017 statement. This is misleading. The 83 percent figure has been widely used by Democrats critical of the tax overhaul. It originated in a December 2017 report from the Tax Policy Center, showing the wealthiest taxpayers will get 83 percent of the benefit of the tax bill starting in 2027. That’s true “only because most of the individual income tax changes expire by then,” FactCheck.org wrote. Between now and then, it’s much lower than 83 percent. In 2018, roughly 21 percent of the tax cut benefits go to the richest 1 percent, a much smaller figure, though still a disproportionate share. Just 11 percent will go to the middle one-fifth, The AP reported. 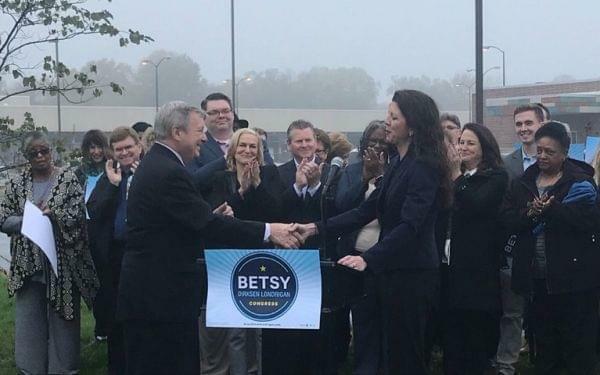 Davis told a crowd at Monday’s State Journal-Register debate over the last two years $6.6 billion in total federal investment went to infrastructure, a "little more than half of what the Obama stimulus bill invested in infrastructure" annually. This is misleading. The federal government alone spent many more times that. The Trump administration’s 2018 infrastructure investment plan proposal alone requested $200 billion in federal investment over 10 years ($20 billion per year). The Congressional Budget Office also says in 2017 alone the federal government spent some $98 billion in matching grants to state and local government for both maintenance and construction capital. Additionally, the American Recovery and Reinvestment Act (the stimulus bill to which Congressman Davis refers) signed during the Obama administration dedicated more than $800 billion to infrastructure between 2009 and 2013. Of that, experts estimate just 10 percent (or $80 billion) went to traditional infrastructure projects. But the bill provided an average of nearly $160 million per year for infrastructure and related costs. According to the Penn Wharton Budget Model, the Trump administration’s 2018 proposed $200 billion, 10 year plan would result in an estimated $177 billion reduction in total federal infrastructure spending. The answer appears to have been meant to substantiate the long-held GOP claim that requiring work of SNAP recipients is not an overly burdensome, nor discriminatory practice, since training and employment can be readily attained. This is mostly false. At Lincoln Land Community College in Springfield, (the college specifically referred to by Davis during the debate) none but one of the dozens of training programs and certifications offered can be completed in four weeks. The exception, the Truck Driving program, can be completed in that timeframe, but does not offer a $70,000 salary expectation. The program itself estimates graduates can expect a range of between $30-$50,000, and in 2016, the federal Bureau of Labor Statistics estimated truck drivers earn an average of $41,340. Most programs surveyed at Lincoln Land take between 8 weeks and 2 years to complete, and only one (in green manufacturing technology) offers the $70,000 salary range claimed by Davis. The Bureau of Labor Statistics further reports that jobs beginning in the $70,000 average annual salary range include (but are not limited to) social and community service managers, commercial and industrial designers, and landscape architects. Each of these requires a minimum 4-year bachelor’s degree. When asked about the GOP-led Farm Bill revisions, Londrigan told the Springfield crowd that with proposed changes to the Conservation Stewardship Program in the new Farm Bill “we stand to lose $1.3 million from Christian, Montgomery, and Macoupin” counties. Londrigan said that might move federal investment to farms with "more irrigation" like California and Colorado. This is at least partly true. The proposed changes to the nation’s Conservation Stewardship program were outlined in H.R. 2, passed in the House on June 21. A different version of H.R. 2 passed in the Senate on June 28. The proposed changes outlined in the House version of H.R. 2 would shift more funding to a parallel program called EQIP, or the Environmental Quality Incentives Program. Illinois has land that participates in both programs, but more land is eligible under EQIP in states like Colorado and California, both of which Londrigan mentioned during the debate. If enacted, the House version of H.R. 2 would give more of the proportional funds available to those two states, and less to Illinois because of its land involvement in CSP. However, the statement is misleading because Colorado as well as Illinois would stand to lose money overall for both programs under the House version of the Farm Bill, H.R. 2. We could not find data by county, but, a University of Illinois analysis pegged the statewide number at $200 million over a decade, or $20 million per year. California, by contrast, would stand to gain the more money than any other state in the union. Rep. Rodney Davis is a member of the conference committee tasked with working out the differences between the House and Senate versions of the new farm bill. 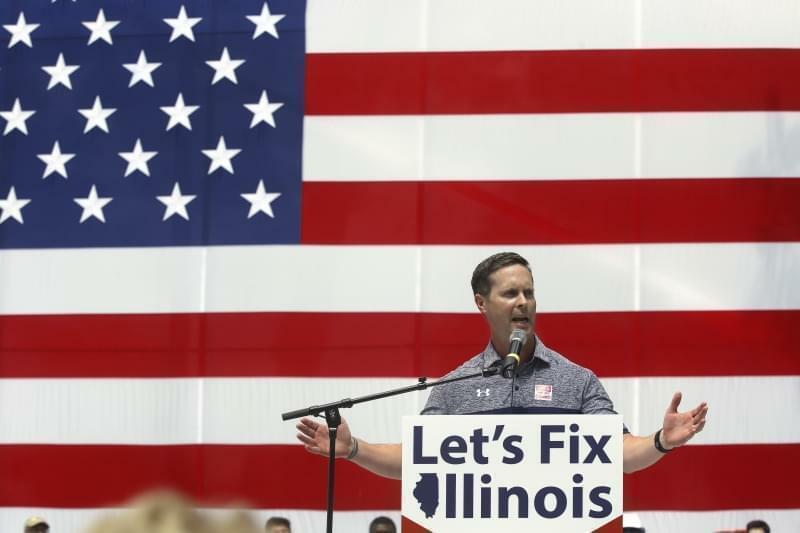 Londrigan told Thursday's debate crowd at Illinois Public Media that soybean farmers in the 13th Congressional District have lost 20 to 25 percent of their crop price since March of this year as a result of the Trump administration tariffs. This is mostly true. As of Oct. 18 at the close of trade, soybean cash prices at the Chicago Board of Trade were at $8.64 per bushel, and the January soybean contract ended the day at $8.78 per bushel. Both have fallen sharply since the trade war with China started heating up this spring. China imposed a 25 percent tariff on US soybeans in July, in retaliation for tariffs the Trump administration imposed against China. CNBC reports the U.S. Department of Agriculture showed lower soybean exports than anticipated, and highlighted a cancellation of 694,400 tons of beans to “unknown destinations,” likely the world’s largest soybean buyer, China. The high mark for soybean prices this year came in early March at $10.71 per bushel. They fell as low as $8.11 per bushel in September, a 24 percent drop. But, prices have since rebounded a bit, and Thursday’s $8.64 closing price is about 19 percent lower than the March high. It’s worth noting, however, that CNN reports China itself is finding its share of trading difficulty as a result of soybean tariffs. Import prices are higher, and China’s emphasis on other cash crops like corn has lead to a glut of those crops, while creating a deficit of soybeans. Since domestic stock is not enough to satisfy local demand, those who are able to get their hands on Sino-grown beans find them “more expensive than U.S. and Brazilian” ones. While Chinese buyers are attempting to hold off on U.S. bean purchases for now, the question remains as to how long it will be able to sustain that pattern. Editor's note: This story has been updated from its original version to correct the number of training programs at Lincoln Land Community College offering a $70,000 salary range. It is "only one," not "all but one."